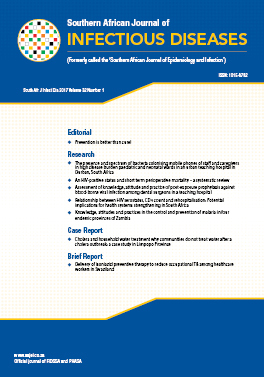 The Southern African Journal of Infectious Diseases (SAJID), formerly called the Southern African Journal of Epidemiology and Infection (SAJEI), first appeared in 1985 as a joint publication of the Infectious Diseases Society of Southern Africa (IDSSA), the Sexually Transmitted Diseases Society of Southern Africa (STDSSA) and the Epidemiology Society of Southern Africa, the latter having subsequently been succeeded by the Public Health Association of South Africa (PHASA). Presently SAJID is published under the auspices of the Federation of Infectious Diseases Societies of South Africa which is an umbrella organisation incorporating IDSSA, STDSSA as well as the Infection Control Society of South Africa (ICASA), the National Antibiotic Study Forum (NASF) of South Africa, and the South African Society of Travel Medicine (SASTM). Scientific papers in the SAJID aim to advance the understanding of all aspects of epidemiology, public health, clinical microbiology and infection. 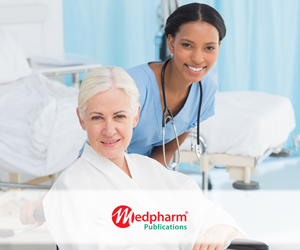 The journal strives to promote research and exchange of information on specific areas of infectious diseases, medical microbiology and virology, covering fields of interest of the societies of FIDSSA and PHASA. Manuscripts describing research performed at southern African institutions and in southern African settings enjoy a high priority, as do health matters covering Africa and the developing world, as well as global issues such as malaria and other tropical diseases, tuberculosis, sexually transmitted infections and HIV/AIDS. The scope of interest of SAJID is wide but the journal aims to maintain and improve the standard of its publications.